Child custody evaluator Jonathan Gould argues in his book, "The Art and Science of Child Custody Evaluations," that children can suffer from a number of psychological and behavioral problems if the relationship with a parent is severed or weakened during divorce proceedings. Many courts look to some form of dual custody -- more commonly referred to as joint custody -- as a way of protecting the best interests of children. Joint custody arrangements do not necessarily require parents to split time with the child equally, and there are many joint custody options available to families. Joint physical custody is an arrangement in which parents each have extended periods of time with the children. The parents may split time equally, or one parent may receive custody during the summer, one week a month or on weekends. Joint custody arrangements are frequently constructed around the school year, age and developmental stage of the child and expressed wishes of the children and parents. Many courts are reluctant to award joint physical custody if the parents are unable to cooperate with one another. An increasingly popular joint custody arrangement is the 2/2/5/5 or 3/3/4/4 arrangement. In this scheme, one parent has the child for two or three days then the other parent has the child for two or three days. Then each parent gets a longer period of time with the child such as five or four days. Joint legal custody arrangements recognize each parent as an important influence in the child's life and grant equal decision-making power to each parent. One parent is typically the primary custodian, while the other is granted visitation or "parenting time." Custody orders for dual legal custody often have a system for resolving disagreements. For example, if parents can't agree on which school and church a child should attend, the mother might be granted final decision-making authority in one area while the father is granted authority in the other area. These arrangements aim to honor each parent's role in the child's life while preventing children from having to bounce from one house to another. Split custody is an extremely uncommon form of dual custody. In this arrangement, the siblings are split up, with each parent having custody of one or more siblings. Each child typically has regular visitation with her noncustodial parent. This arrangement can be extremely damaging to children and problematic for family unity. It may, however, work as a temporary custody arrangement. For example, a child going through a period during which she is heavily bonded with her mother while her brother wants to spend time with his father, could benefit from short-term split custody arrangements. However, children often end up feeling like commodities in traditional, permanent split custody arrangements. According to the textbook "Child Psychology," children in some form of joint custody arrangement typically have better academic performance, higher scores on tests of adjustment and fewer mental health problems than children who live primarily with one parent. Joint custody arrangements may also be better for parents. Both mothers and fathers may report lower levels of stress, greater satisfaction with their custody arrangement and better attachment to their children when engaged in joint custody arrangements. In joint legal custody arrangements, noncustodial parents may be more likely to pay child support than parents who do not have joint legal custody of their children. Families in which there is abuse or parents are incompetent caregivers, however, are not good candidates for joint custody. Child Psychology; Robin Harwood et al. The Scientific Basis of Child Custody Decisions; Robert M. Galatzer-Levy et al. 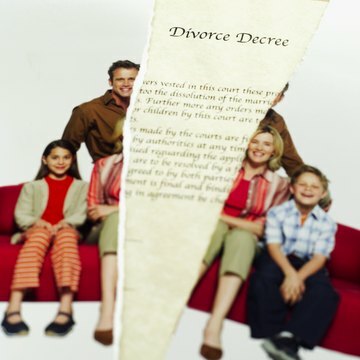 Courts often decide custody matters during a divorce. This includes both decision-making authority and where the child lives. Although terminology can differ among states, the parent who spends the least amount of time with the child is often described as having secondary custody.